I give Western Powders Inc. permission to use my photo. Blackhorn 209 delivers high performance results for muzzleloader & black cartridge hunters at every level – but nothing speaks for the quality of our product better than the hunters who use it! Please send us photographs of your trophy animals taken with Blackhorn 209 to add to our web page or brochures. 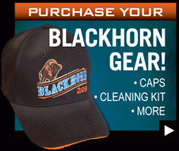 If we use your photograph in one of our brochures, we will give you a free Blackhorn 209 cap in appreciation for your efforts. Congratulations on your hunting success and thanks for the support! WARNING: Some photos contain graphic images that may not be suitable for all ages.